elobeatlesforever: Caught Live: Stand Up & Rock! Hello... Hello ... my old friends ... It's great to see you once again! The success of Made In Brum last year created an immediate demand for another series of shows with the same format. As a result of that interest, Stand Up & Rock! was conceived and has just begun a three month UK theatre tour. Wolverhampton's Grand Theatre was the venue for this the seventh date of the tour on Tuesday 16th September and the full house was treated to a fantastic night of comedy and music led from the front by Brummie legend Jasper Carrott who, like myself, thought that the best-selling book "50 Shades Of Grey" was a book about West Bromwich! 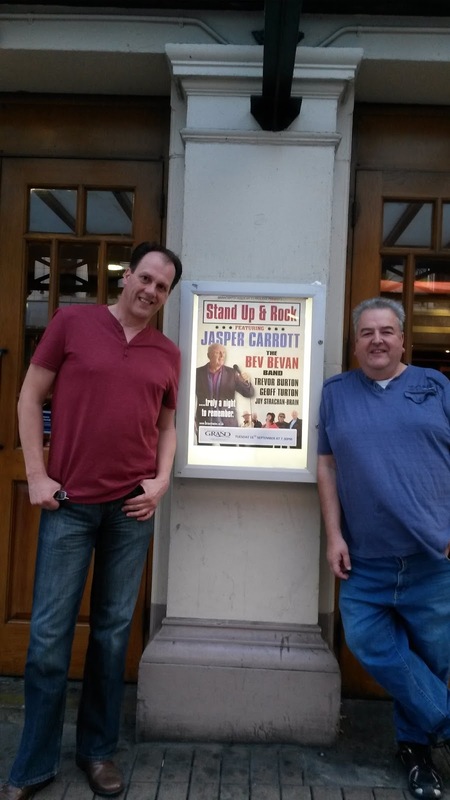 Both spells of his stand-up comedy, centred around his own unique observations on several topical subjects, had the audience often laughing and chuckling. Jasper was assured and confident throughout and also sang lead vocals twice with the band. But what of the music? 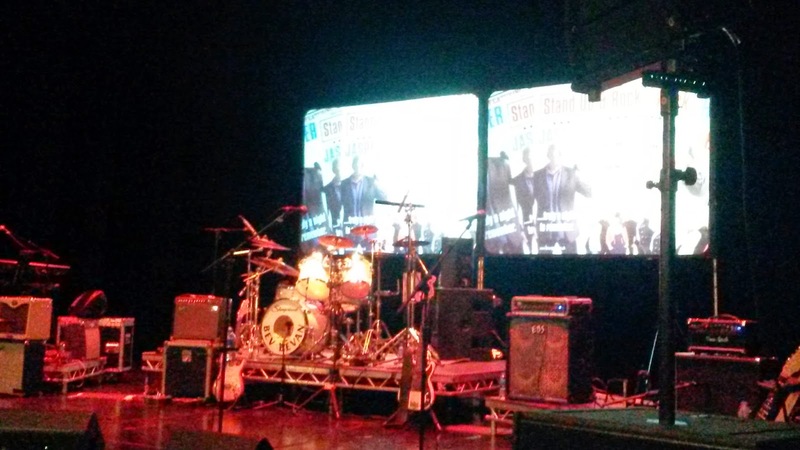 The Bev Bevan Band [once again] provided a marvellous platform of music for the show in front of the watching Tony Iommi, impressively arranged by guitarist Tony Kelsey, repeating his role as Musical Director. The keyboards and vocals of Abby Brant were world class, as were the performances of bassist Phil Tree and the sublime drumming of the ever popular Bev Bevan. Without providing too many spoilers for those still to see the show, Yours Truly KJS was amazed by The Rockin' Berries' very own Geoff Turton's rendition of a certain Roy Orbison classic and pleasantly surprised to hear new covers of tracks by the likes of The Who, Status Quo, Elvis Costello, Kiki Dee and The Rolling Stones alongside familiar songs by The Moody Blues, Jimi Hendrix, The Spencer Davis Group amongst not a few others. Once again, we were treated to the inestimable guitar prowess and personality of Trevor Burton as well as the mesmerising vocal talents of Quill's very own Joy Strachan-Brain. Fans of The Move, ELO and The Beatles will be pleased to know that each artist has a two song contribution to a balanced and thoughtfully constructed set list. Upon entering the auditorium, I expected a kind of Made In Brum Part II yet I left the building impressed, contented and fully entertained by a show which is fresh and does far more than it says on the tin, so to speak. This is a show that literally rocks! 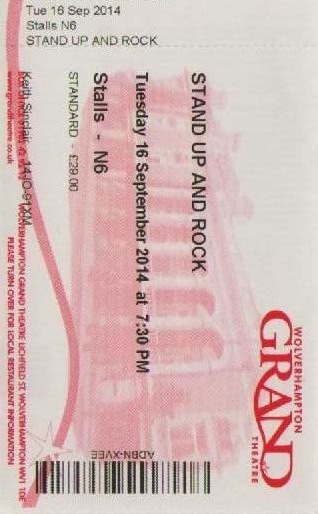 Stand Up & Rock! 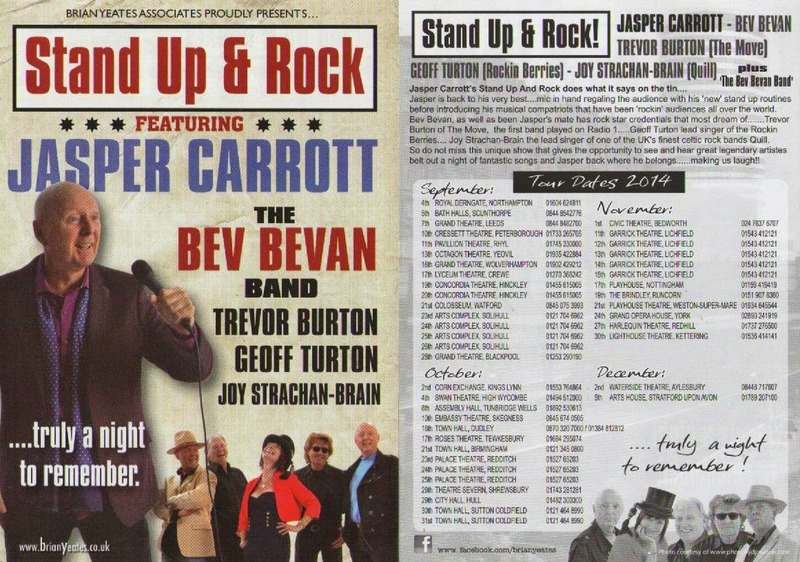 features Jasper Carrott, The Bev Bevan Band [who are Bev, Phil Tree, Tony Kelsey and Abby Brant], Trevor Burton, Geoff Turton and Joy Strachan-Brain. ELO Beatles Forever [ELOBF] recommends Stand Up & Rock! to those enlightened folks who also like ELO, Jeff Lynne, Roy Wood, 'Brum Beat', The Idle Race, The Move, The Beatles and their musical relatives.